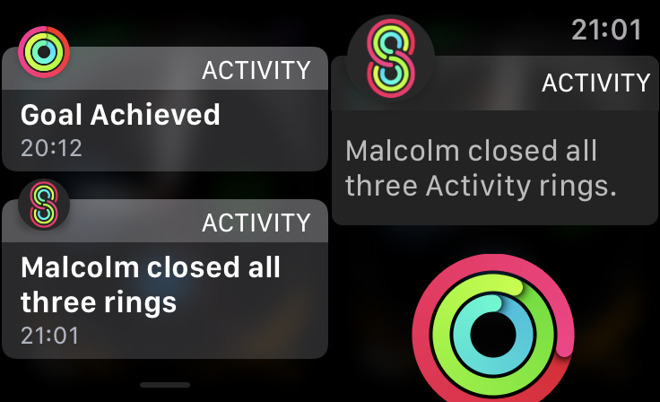 It is ridiculous how good you feel when you close all three rings on your Apple Watch's activity app. It's preposterous how bad you feel when you're heading to bed and it notifies you that "you can still do it." 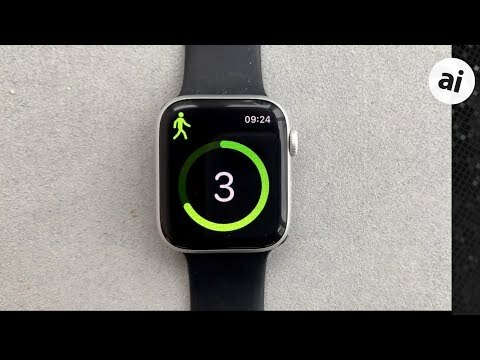 These features have already made you just a little bit fitter, a little bit healthier -- and there is something more your Watch can do. With a few steps, you can have it so that every time you do a workout, your friends are notified. You can have it so that when you get a medal for completing the longest move workout, they get told about it. And, you can have it so that at any moment, any one of them you've shared this information with, can see precisely how much exercise you're getting. You're going to be using this entirely on your Watch, but that's not where you start. You don't set this up on your Apple Watch and you don't set it up on your iPhone's Apple Watch app. Instead, you have to go to your iPhone and a completely separate Activity app. It's highly likely that you've never opened this before, and you may not even know it exists because usually all it does is give you a history of your activity. However, tap on the Sharing button at bottom right. This is where you'll see a list of all the people you've agreed to share your activity data with and to add someone new. 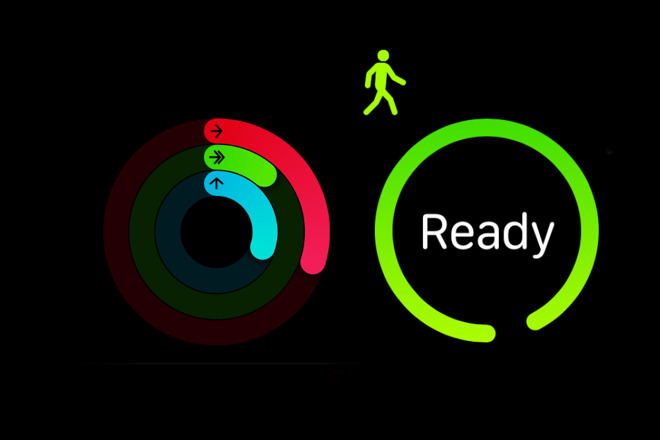 At a glance, you can see the activity rings of all of them. This opens a very short email form, really just a To: field. This is an odd touch because while you can type any address into that To: field, there's no point. That can seem a little creepy at first. Yet it does make sense. If you write a text to someone who has an iPhone, your phones knows that they do and so sends it over Messages. If they haven't got an iPhone, your phone sends the message as a regular text one. So, Apple knows what phone numbers are being used with iPhones. And since every Apple Watch must be paired with an iPhone, it knows whether any given phone has a Watch with it. Tap on the name of one of these people and they'll be sent an invitation. At some point, they'll get and accept it, and then you're ready. 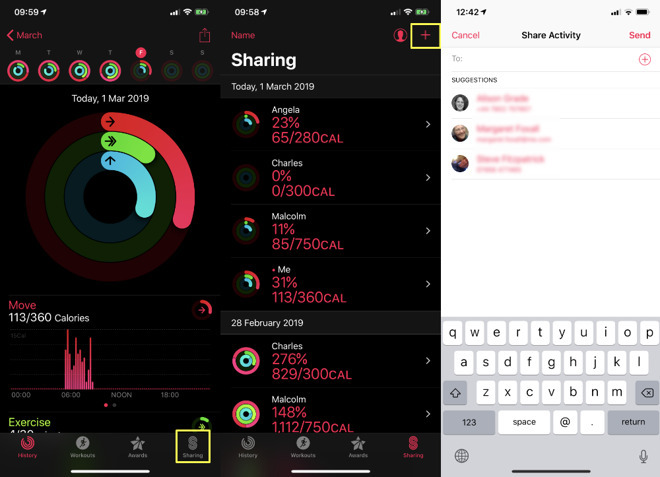 As well as now seeing all of their exercise details in your iPhone's app, you'll get the same information on your Watch. You can see what they're up to, they can see what you're doing, and you can send each other messages. By far the most useful and demoralizing feature, though, is how the Watch will now send you both notifications. You've had that prod saying "A brisk 7-minute walk should do it" but this is worse. Now you get automatic notifications like "Malcolm has closed all three rings." Tap on a person's name to see all their exercise details and then tap on the Compete with... button. As you imagine, it sets up a competition between you. These contests vary but you're always both given a goal and whoever gets there first is allowed to be unbearable. This is all peer pressure coupled to our dependence upon devices and our Pavlovian inability to ignore notifications. It is in every way a terrible idea -- except that it works to make us fitter and it works very, very well. I tried to use it numerous times when this feature first appeared several generations ago. Could never get it to work. How do the contests vary? Every time I've used it there was a 7 day contest with points awarded based on percentage of rings closed. Each competitor could receive a maximum of 600 points per day and whoever had the most points after 7 days was crowned the winner. This is also how competitions are described in Apples online resources.